By Friday, February 1, the vortex and the Arctic air it funneled into cities from Fargo to Pittsburgh to Detroit had prompted days of school and business closures, thousands of flight cancellations, a halt to mail deliveries, and a smattering of power outages and pleas for reduced heating. At least 21 people died and dozens were injured in weather-related incidents. Officials warned residents to stay inside, even as meteorologists began to forecast spring-like weather and the likelihood of an 80-degree temperature swing within a few days. It all started after the polar vortex that normally hovers over the North Pole split in two on January 2, the result of planetary waves breaking in the stratosphere, said Stanford atmospheric scientist Aditi Sheshadri. "When the polar vortex splits into two, the jet stream moves south over the Atlantic basin, and it takes all of the storms with it," said Sheshadri, an assistant professor of Earth system science in Stanford's School of Earth, Energy & Environmental Sciences (Stanford Earth). "We have no idea during a given event exactly when the storms might strike, but on average you see impacts for a month or two after the vortex splits." Sheshadri explains the science behind the polar vortex and its dangerous effects on weather experienced at Earth's surface, how the phenomenon is related to carbon dioxide emissions, and why the vortex can be expected to bring more winter storms and Arctic air to parts of the United States and Western Europe in the years ahead. ADITI SHESHADRI: The polar vortex forms every winter because of the temperature difference between the equator and the poles. In the polar stratosphere, sunlight basically gets cut off during the late fall and early winter – and that makes it really cold, while the equator remains quite warm. A jet forms to balance this temperature difference. This jet is what we call the polar vortex or the polar night jet. It flows in a complete circle around the pole, 10 kilometers or a little over six miles above the Earth's surface. 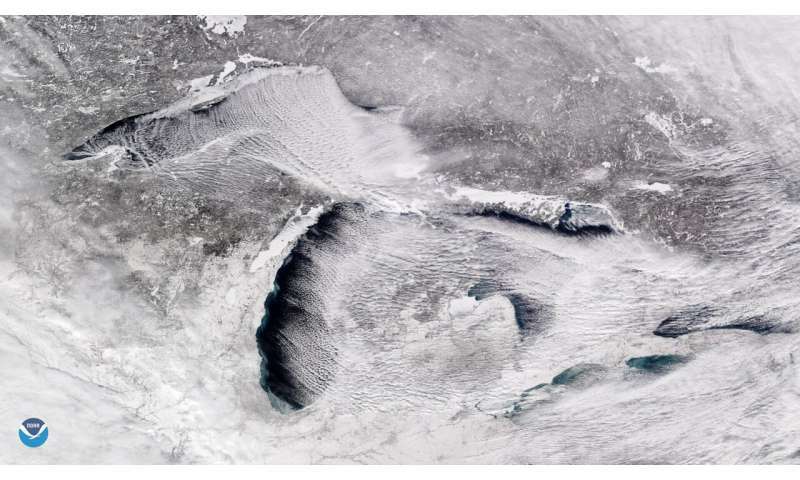 What drives the behavior of the polar vortex? AS: It's strongest in the middle of winter when the temperature difference is at the maximum. But at the same time, the polar vortex is this living creature. It's affected by waves created at the surface of the Earth, which get excited by things like flow moving over mountains or flow moving over land and sea, which heat up to different extents. If Earth's surface was completely flat – if you had an aqua planet with ocean all the way around – then the polar vortex wouldn't break up. These flows of air, known as Rossby waves, propagate upwards into the stratosphere, where they break just like waves break on a beach. You have this vortex that's peacefully going around the pole. Every time a wave breaks, it imparts momentum to the vortex. Sometimes a breaking wave can be strong enough to displace the vortex over the pole, or even reverse the direction of the vortex. When that happens, the temperature in the polar stratosphere can go up by 50 degrees in a week. It's really an extreme event. These waves can also perturb the vortex enough that it splits into two segments, called daughter vortices. What happens when the vortex splits? AS: One segment usually moves over Siberia and the other moves over North America. Once that happens, the jet stream in the troposphere over the Atlantic moves to the south. Cold Arctic air that's normally corralled by the jet stream around the pole is then able to go into the middle latitudes on the East coast, in the Midwest and over Western Europe. Storms, which ride along the jet stream, move south, too. They don't necessarily shift immediately: it can take a few weeks for them to organize themselves to respond and catch up to the jet. Storms that would have hit Canada come and hit New York and Chicago instead. Why doesn't the polar vortex bring similar weather to the West coast? AS: We don't quite know why the polar vortex doesn't affect the Pacific basin, but we have some initial hypotheses. We think it has something to do with the location of the jets in the two basins. In the Atlantic basin, the jet stream is located at higher latitudes. In the Pacific basin, it's closer to the equator. Topography may also play a role. In the Atlantic basin, air flows over the Rockies and waves come off of those high mountains and affect the jet stream. In the Pacific, the jet stream is further away from any mountains that might generate disruptive waves. How do human activities affect the polar vortex? AS: Increasing carbon dioxide in the atmosphere cools the polar stratosphere, which could increase the temperature difference between the pole and the equator and strengthen the polar vortex. There's also some model evidence that the waves that are propagating upwards in the troposphere are getting more energetic as the planet warms, leading to a more perturbed polar stratosphere. The polar vortex itself is not new, but it seems to be affecting weather on the surface every year now in a way that it didn't in recent memory. What changed? AS: The term "polar vortex" has been around since the late 1940s. It forms every winter and breaks up in the spring. But for the last 20 years or so, the polar vortex has been very, very disturbed in the middle of winter. Between 1989 and 1998, however, there were no split vortex events in midwinter. And if you look at polar vortex events starting in 1979, when satellite data begins, until now, the vortex either splits or becomes displaced on average only about once every other year. We don't understand what drives the variability of these events from decade to decade, but they're definitely happening more frequently. It seems there is still a lot remaining to be understood as to what drives the functioning of polar vortex, and to what extent. Rainbow (jet) is a non-uniform color misleading the graphics. Its use must be abandoned. You can see the increasing current density of the single vortex (above animation) until it splits in two to reduce the current density.